The Duke and Duchess of Cambridge, less formally known as William and Kate, toured the Kaziranga national park in Assam, India in an effort to raise conservation awareness. Sadly, only hours after their visit, poachers killed one of the park's rhinos and left with its horn, reports the Guardian. Park personnel were alerted to the slaying by a series of gunshots. When they arrived at the scene, they found the deceased and de-horned animal and upwards of a hundred spent AK-47 cartridges. Catherine, Duchess of Cambridge participates in an arts class with street children at a contact centre run by the charity Salaam Baalak, which provides emergency help and long term support to homeless children at New Delhi railway station. The Duke and Duchess of Cambridge receive a drawing from well-wishers during a visit to a contact centre run by the charity Salaam Baalak. Kate draws with street children at a contact centre run by the charity Salaam Baalak. The Duchess wore a $70 dress by Glamorous UK. A young boy asked Kate to draw a picture of her home, and then they colored the drawing together. Kate and William meet children during a visit to Salaam Baalak Trust. Catherine, Duchess of Cambridge meets Prime Minister of India Narenda Modi. Prime Minister Narendra Modi with Britain's Prince William and his wife Kate Middleton before their meeting at Hyderabad House. The Duke and Duchess of Cambridge with the Prime Minister. The Duchess of Cambridge wore Temperley London for the occasion. Kate's dress had a few panels of fabric added to cover some of its sheer elements. A close-up of the lace detailing on Kate's dress, as well as her clutch. Kate pulled her hair back into an elegant chignon, pairing the look with pretty sparkly earrings. The Duchess continues to delight in bright colors on this tour. Kate and William pose with India's Prime Minister. Forest guards fired at the perpetrators but were unable to stop them from fleeing. Poaching is becoming an increasingly common problem at Kaziranga. 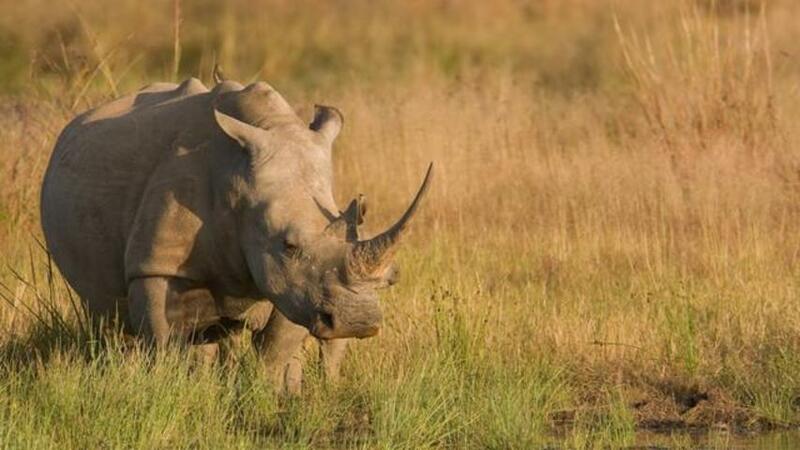 About a half dozen rhinos have been killed there this year.